I have a new listing in San Francisco that you must check out! This property is definitely a one of a kind penthouse condo with views open both days this weekend. Also check out my other recent activity highlights, and super interesting news articles: Insights on Bay Area Traffic, Income Allowance Changes by Lenders due to the "Gig Economy", and Bay Area Exodus. I've summarized some Year over Year statics for all the geeks out there, so be sure to read and share my insights. Enjoy the Lunar New Year celebrations! BRAND NEW ON MARKET @ $1,499,000! 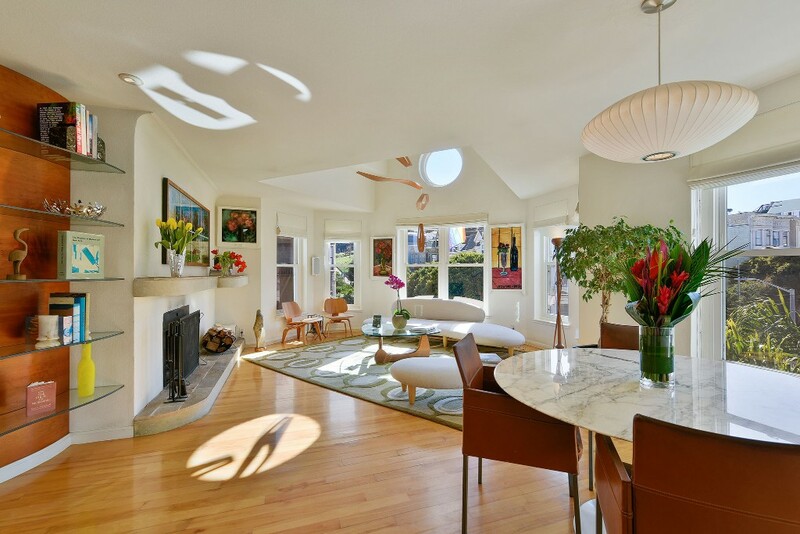 Extremely Rare; Absolute One of a Kind Corner Penthouse in Historic Alamo Square. Architecturally unique, this absolute gem of a two bedroom, two bathroom with wood-burning fireplace corner penthouse has never before been offered for sale since it was newly constructed. Open this weekend both days from 2:00 to 4:00. 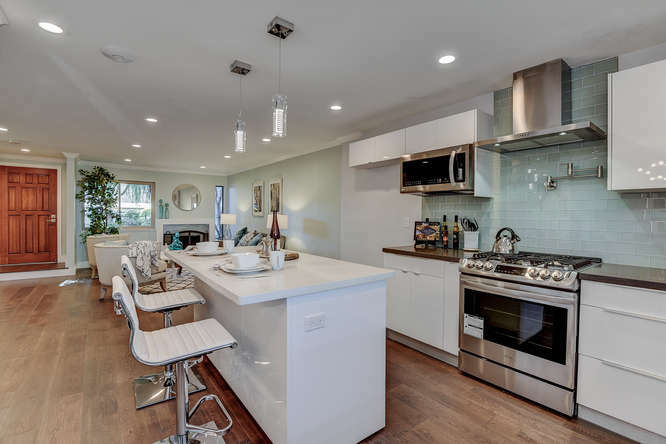 Fully remodeled townhouse sold in 7 days for $1,550,000. Everything is upgraded from the studs inward using high-end materials and ultra-modern designs all hand selected by my wife Alejandra. Click here to visit her website where you can inquire about her interior design work. Sold - $170K Over Asking! Multiple offers received on this exquisitely maintained 1,300 sq ft, 3 bed & 2 bath house with a remodeled kitchen, double pane windows, and wood flooring throughout. CLICK HERE to virtually walk the home. 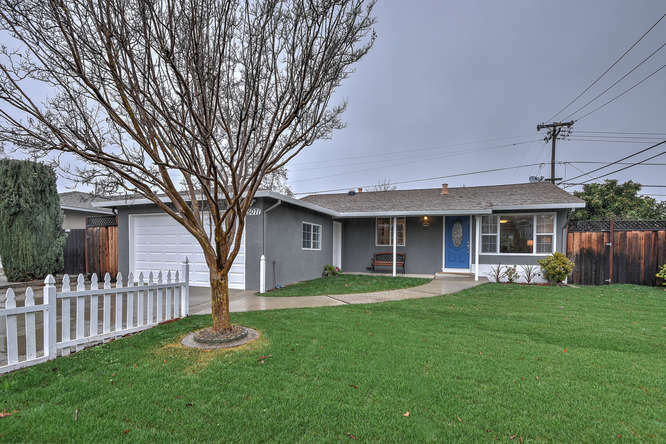 A phenomenal gem in a very highly desirable and convenient location in Silicon Valley! Do you or someone you know want these kinds of results in the next 12-18 months? You'd be surprised how much strategy and planning went into achieving these goals for my clients. 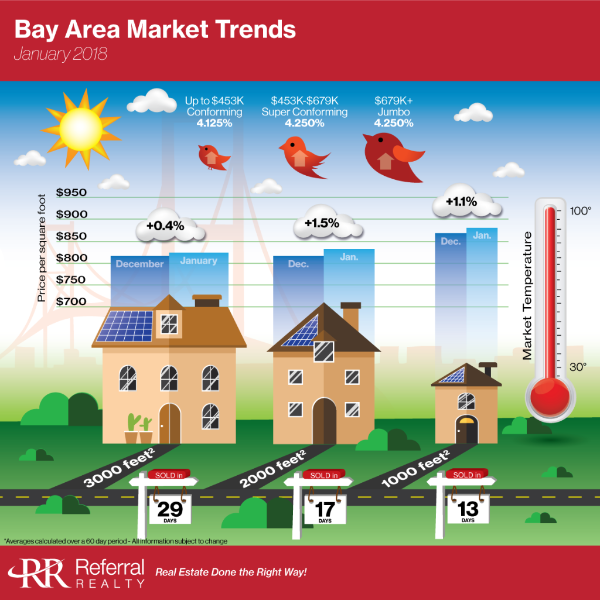 All homes rose in price throughout January, and the time on market stayed relatively flat. Days of Inventory jumped up to 33 days from the low of only 12 in December which is a much healthier number. The good news is inventory is rising which should help buyers get into contract easier, and help sellers feel confident that they can find a replacement home. For year over year increases, large homes were selling for an average price $827/sf in Jan '18, an increase of 10.6%, medium homes for $832/sf, an increase of 23.2%, and small homes for $878/sf, an increase of 26.7%. I expect prices to continue their upward trend throughout the rest of 2018 and possibly the first half of 2019. Let me know if you need any advice on how to navigate the market or create a plan for the future. Almost everyone in the Bay Area wants something done about the chronic traffic congestion choking the region. But when asked what would get them out of their cars, most said there isn't much chance of that, according to a new poll. Homeowners soon will be able to count income they earn from Airbnb Inc. rentals on applications for refinance loans. A new program—expected to be announced on Thursday by Airbnb, mortgage giant Fannie Mae and three big lenders—will allow anyone who has rented out property on Airbnb for a year or longer to count some or all of that money as income. The Bay Area exodus is real and ongoing. The region leads the nation for outward migration, a new study has found. Copyright Â© 2018 Referral Realty, All rights reserved.